How would you like to go to Arizona in December? Did I hear my wife correctly? Since we live in Maine the mere thought of warm Pheonix winter weather had my attention. My wife had just heard that Pathway to Heath was going to be hosting an event in Phoenix December 25-27, 2017. My wife and I have four adult kids that no longer live with us, maybe they would be able to come spend some time with us in Phoenix as well. Pathway to Health was starting to sound like a fun way to spend Christmas. If you haven’t heard of Pathway to Health and wish to know more about this mega-clinic press here. In preparation for the big event, numerous online webinars were presented to prepare us ahead of time. The main thought that came across was that the motivating factor for everything done in Pheonix was to be Christ-centered. I like that. While working on my patients in Pheonix, a phrase kept rolling around in my head. In Matthew 25 Jesus tells a story about selecting His sheep. The part that I kept remembering was the part about “ye have done it unto me . . .”. Can I think of this time as time I spent doing root canals as time spent with Jesus? Would it be accurate to think of this time as a spiritual experience? There were times when we were encouraged to work faster, but I didn’t take it too seriously, I had Jesus in my chair, and I wasn’t going to hurry, I wanted every patient that I met to know they were loved, through the language of root canals. Pathway to Health dental is impressive. It is a mega mobile dental clinic in every sense of the word. It boggles the mind to think of all the different systems that are in place to make the 2 1/2 days work. Not everything was ideal, but I was impressed, with the fact that people can even dream to accomplish something that big. 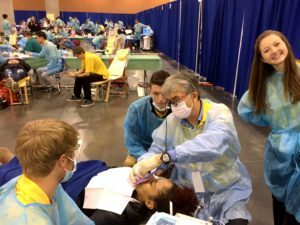 Through the years we have gone on numerous dental mission trips. Most of the time on these dental trips I do fillings and extractions, mostly extractions. Rumor had it that there were going to be over 80 dentists in Phoenix. Because there were going to be so many dentists, I thought it would be fun to focus in on root canals only. I’m not sure on the final numbers, but I think I did around 12 root canals. Mostly premolars and anterior teeth. I did do 1 molar and 2 endo re-treats. While I was there I kept thinking, what would it take to have 6 to 8 chairs devoted to root-canals only? The following is a starting point, a checklist for an endodontic department for the next Pathways to Health. 6 to 8 chairs geared for endodontics only. SW Airlines owns and operates 737 only. As much as possible I would recommend picking 1 endodontic manufacturer and maintaining that only. KISS. Stephen Jobs also touted the idea of utilizing all your components from one manufacturer. So in this instance, it makes sense to use the burrs and gutta-percha and paper points from the same manufacturer. I would recommend Dentsply Sirona as much as possible. In addition to the 6 to 8 chairs, I would recommend an Endodontic supply station set up at the endodontic location of the 6-8 chairs. Dental assistants don’t like to move, for this reason, I would recommend setting up an Endo supply table next to the 6 chairs. And utilizing “runners” to get supplies from general supplies to the endodontic supply table. This may be helpful in the restorative section as well. This may be hard to visualize but I would think of the main dental supplies as the centurion and have smaller supply stations as decaturians. Nomad x-ray Unit. 2 if possible. Analog film 4 boxes. Apex Finders – Morita 6 units. WaveOne Gold Reciprocating Hand-pieces. 6 units. GuttaCore Obturator Oven. 6 units. Wave One Gutta Percha All the colors. Wave One ProGlide all colors. Wave One Paper Points all colors. If you can see something that should be added to this list please drop me a note below, I would love to hear from you.